Click image to zoom in FULL SIZE. Picture by maxpixel.freegreatpicture.com. Home security starts with securing the entrance points into the property, namely doors and windows. We often think of housebreakers sneaking around at night, working in total darkness armed with nothing but a torch. This is the stereotypical vision, but it’s not the reality. The majority of house break-ins occur during the day, when homes are empty. In this article we take a look at rim locks, what they are, and where you might want and not want to fit them in your home. You can’t use rim locks as a strong security measure, but there are still reasons why you may want to consider them. Don’t forget too, any locked door offers more safety, security and privacy than one that’s unlocked, whether it’s an external or internal door. It’s amazing how many properties are easy targets, no thanks to the ignorance of the occupants. It’s also useful to have a little added security inside the structure as well as protection from the outside. Precautions like rim locks and door stoppers can help to secure you in a “safe” room and wait for the police. This is useful if an intruder enters your property while you’re still at home. Remember, burglars love structures that have little effective security in place, and they know how to spot it too. I will start by explaining what rim locks are not. They’re not ideal for the main entrance, usually the front door, into a home. These locks are not as secure as the internally mounted mortise locks, which offer the best overall protection. If you do have a rim lock on the main entrance, then consider changing it or support it by adding extra security devices like bolts. The reason rim locks are not ideal for the main entrance is because they’re attached by a just few screws. This means someone can remove them using a simple screwdriver. Your doors are not kick-proof with rim locks either. Rim locks exist because doors never used to be thicker than one inch, and so couldn’t house stronger mortise locks. Most main entrance doors today, though, are between 1.5 to 2-inches thick. The most common use for rim locks today is to provide basic security and privacy for internal doors. You often find them on bathroom doors and other rooms where someone might want to add a little extra security and privacy in the home. Don’t think of rim locks as good security options because they’re not. The main reason people use them today is to provide a little privacy for certain rooms. This could be a bathroom, a bedroom or any other room where the occupants might want more privacy. It’s why the building profession refers to them as internal locks. The other use is for decorative and aesthetic reasons. 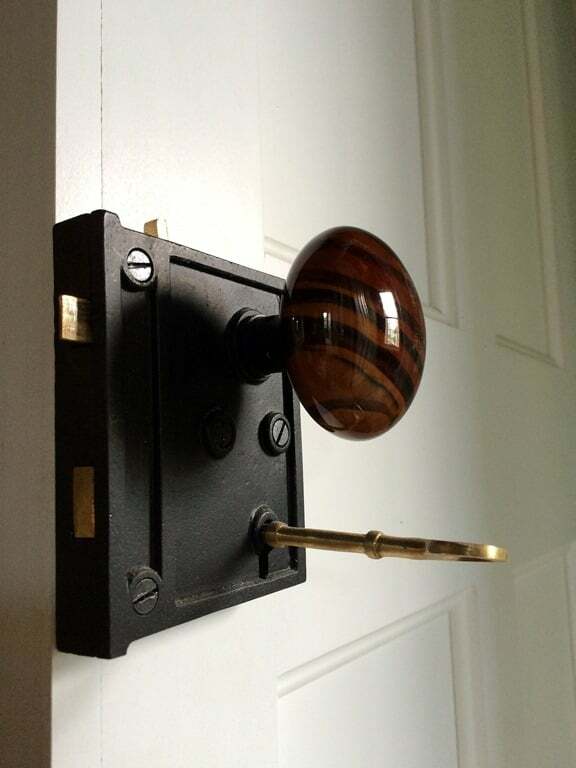 Some rim locks are very beautiful when used as door furniture, especially on period homes. You can find them in various materials too, including brass, bronze, cast iron and even wood. The mechanism of a basic rim lock is not hard to understand. With a locked door (rim lock engaged), a simple bolt extends from the door’s side to secure it. This bolt goes into a fixed notch on the door’s frame and that’s it, door locked. To open the locked door you need a key. Almost all rim locks have a cylinder lock mechanism. A quick turn of a key rotates the cylinder which connects to a piece of metal called the cam. The cam then moves the plug which slides the bolt to disengage the lock. The other useful thing about rim locks is that they’re reasonably easy to fit for anyone who’s handy around the home. That said, if DIY is not your thing, get a professional to fit the lock for you. Rim sashlocks have a simple latch that requires a handle or a thumb-turn to retract it. This often comes as part of the lock kit. Rim deadlocks have just a single bolt and do not need a handle. Most rim locks function with a set of door knobs that usually come as part of the rim set. On one of the door knobs will be a backing rose, which goes on the non-lockable side of the door. Use them mostly on the inside doors of your property. Rim locks add privacy and a little security to interior doors for rooms where you need it. Security experts do not recommend rim locks on exterior doors that are able to accommodate stronger locks. Use rim locks on thin exterior doors that are not thick enough to accommodate a mortise style lock. As they are weak locks—from a burglar’s perspective—you want to add additional security to reinforce the entrance doors. Also consider using rim locks as part of the door furniture if they suit your taste and complement the interior design. Anyone who wants to add a little extra layer of security and privacy inside the home should consider rim locks on doors that don’t have any locks. They are particularly good options for people who share an accommodation or live in lodgings of some description.